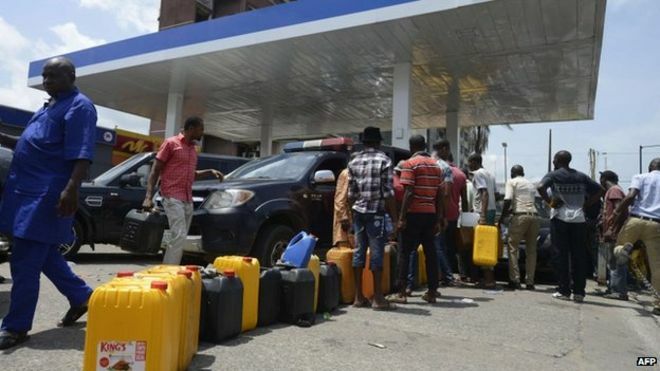 The Group Managing Director (GMD), Nigerian National Petroleum Corporation (NNPC), Dr Maikanti Baru, on Saturday assured Nigerians that the era of fuel scarcity is gone for good. Receiving the Man of the Year Award from Nigeria NewsDirect newspaper, the NNPC GMD said that the corporation had learnt a great lesson during the recent fuel scarcity in the country. “We have actualized the lessons learnt, part of which is to ensure that at any point in time, there should be sufficient products available for distribution across the country. “Most of our PPMC depots in Ejigbo, Mosinmi, Ibadan and other parts of the nation have sufficient product for distribution now. ‘NNPC is discussing with security operatives to stop smuggling of petrol products across our borders. “We are working along side with them to ensure safety of our pipelines because we still have some areas in which vandals still disrupt our pipelines,” he said. Baru said he dedicated the Man of the Year award to all staff of the corporation. Also speaking, Dr Diran Fawibe, Chairman, International Energy Services, urged NNPC to ensure that the nation’s refineries worked to its full capacity. According to Fawibe, the oil and gas sector is a major sustainer of the nation’s economy. So shall it b oo..